I absolutely love warm roasted potatoes and onions on my salads. I’m not entirely sure why but I think it’s fabulous! Seeing how it’s practically Summer you could definitely serve this Warm Lemon Rosemary Roasted Vegetable Salad cold, but I think it loses some of its charm. Usually roasted potatoes only end up on my salad if I am rummaging through the refrigerator trying to figure out what needs to be eaten, but today I made these potatoes and onions especially to complement the flavors of this salad! Lemon and rosemary keep it summertime fresh! Full Disclosure: I have been eating some variation of this salad every night for almost 3 weeks now. I know. That’s a long time. My dinners progress as follows when my Husband is out of town: the first week I am all inspired to try new things and flavor combinations; and then during the ensuing weeks I get really lazy and sad and I eat salad every single night. 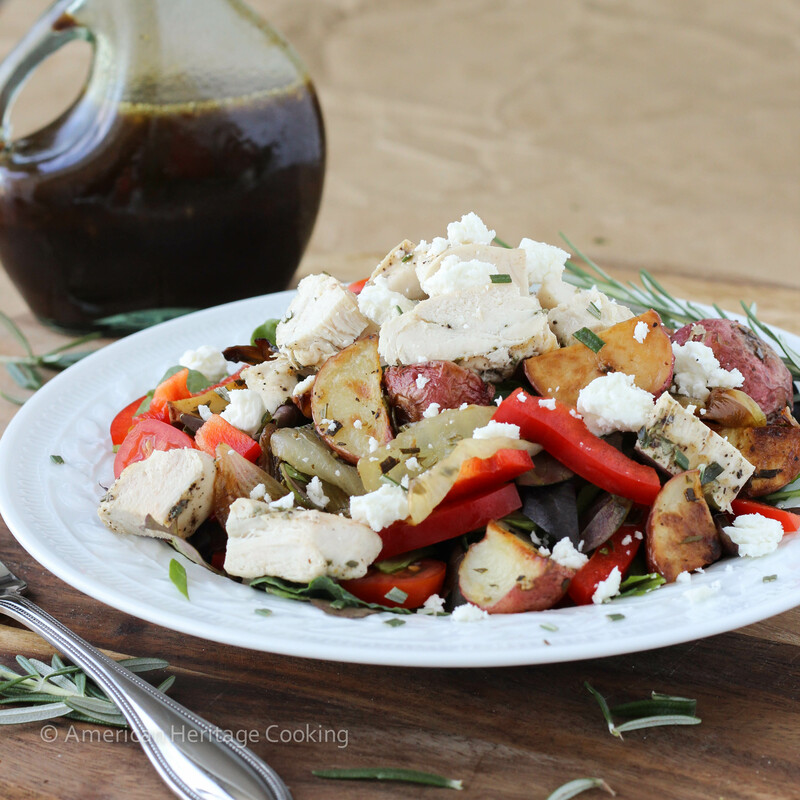 Usually I mix it up at least every week but I fell hard for this Warm Lemon Rosemary Roasted Vegetable Salad. Really hard. I’m still not sick of it. It’s that good! Two weeks ago I added roasted sweet potatoes and tomatoes to the roasted veggie mix and it is even better, so I’ve included that in the instructions below. I also added red grapes as a salad topper and toasted pecans. 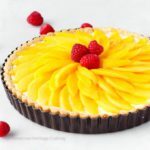 They all add just a little something extra, so I made the changes in the recipe as well. 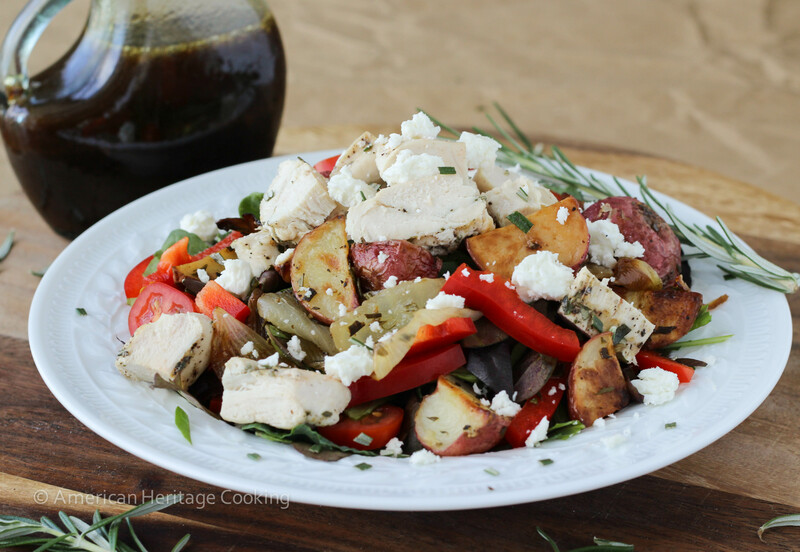 And before you ask, yes, that is the very same grilled rosemary chicken that I use on practically every salad! I know, I know, but it’s just so good and so EASY I can’t help myself! I told you I make it ALL THE TIME, but you didn’t believe me. 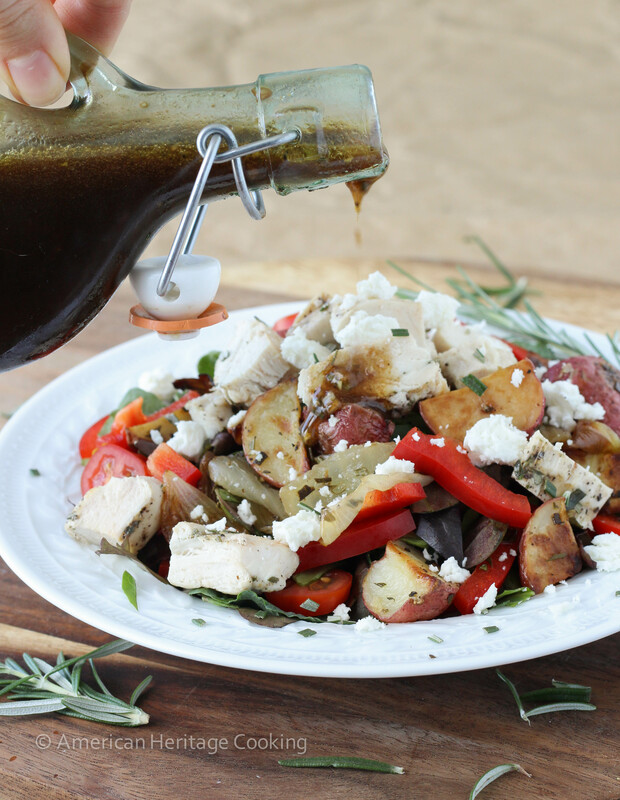 This Light Lemon Balsamic Vinaigrette is a riff on my go-to balsamic salad dressing. I like to invert the proportion of oil to vinegar to make a healthier dressing, but you could flip them back if you want. You want to know what’s really tragic? I’ve been eating some of the leftover roasted veggies with scrambled eggs for an easy lunch. Add some grated asiago cheese, and you’ve got yourself a tasty meal! This Warm Lemon Rosemary Roasted Vegetable Salad with a Light Lemon Balsamic Vinaigrette is easy, flavorful and packed with healthy fruits and vegetables! 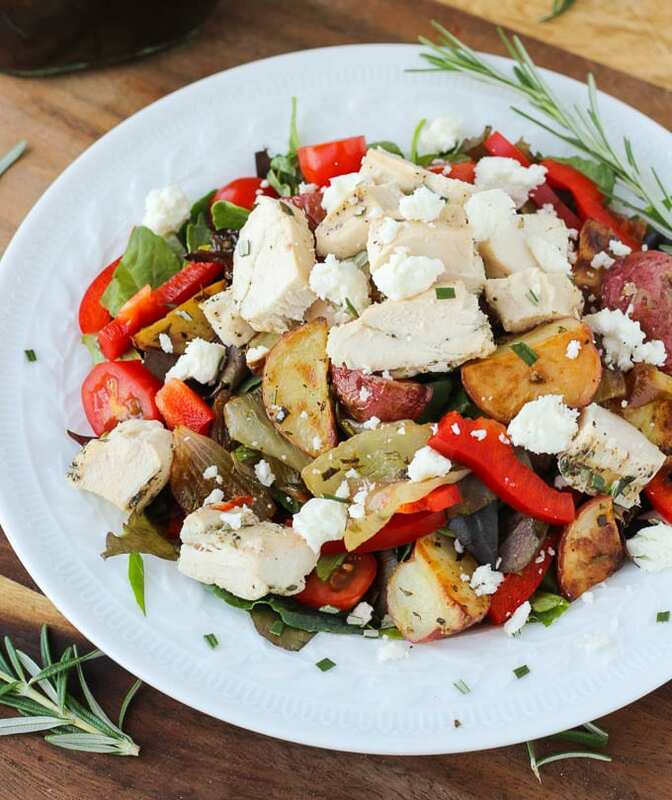 It can be served with or without grilled rosemary chicken! Preheat oven to 400°. Mix together all the ingredients under “Roasted Potatoes & Onions” except the lemon juice. Add more oil if needed, the potatoes should have a nice sheen but they should not be drenched. There should be no excess oil in the bottom of the bowl. To be completely honest, I don’t measure my olive oil. I drizzle some on, sprinkle some salt and pepper and all the herbs and then mix and check to see if each piece has a nice sheen, a few visible granules of salt and some cracked pepper. If they are missing any of those elements, I add more. Easy peasy. Spread out in one layer on a rimmed baking sheet or you might need several depending on the size of your sheets. Bake 40-50 minutes, turning several times throughout, until the potatoes are browned and a fork pierces them easily. 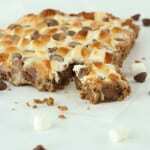 If you overcrowded your baking sheet (I do it all the time! Bad) and your veggies are done but not as nicely browned as you would like, flip on the broiler, move the oven rack up one notch and broil until they get a level of browning that makes you happy. Remove pan from the oven and squeeze half a lemon over top. Gently toss to distribute the juice. 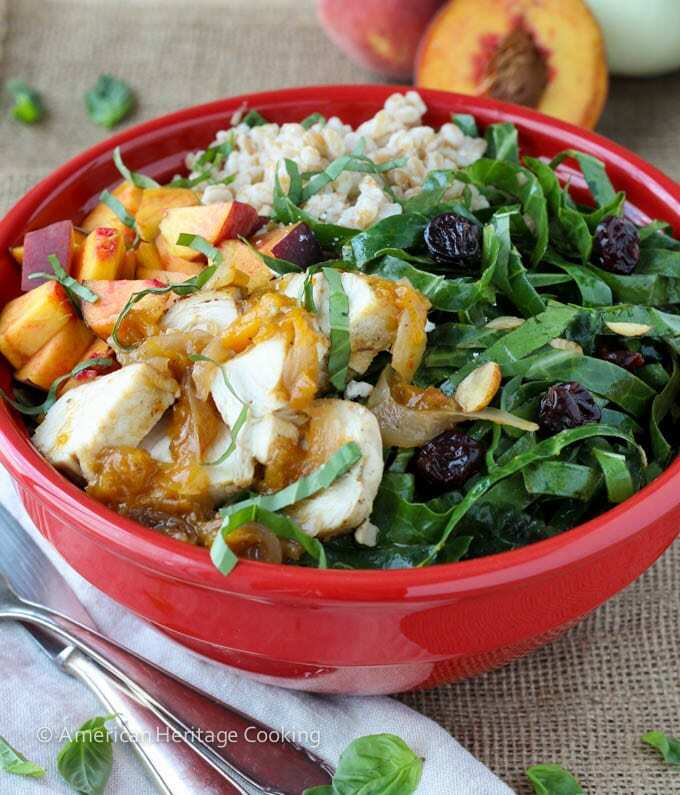 While your veggies are roasting, prepare the rest of your salads. Set aside until chicken and veggies are done. Prep your chicken. And make your salad dressing. When the veggies have ~20 minutes left on clock, prepare your chicken. It should be done resting just as the veggies are being pulled out of the oven! I love a well timed meal, don’t you? I add all the ingredients in a 1 cup measuring cup, whisk it up and then pour it into a jar or glass, sealable bottle. Then I shake it until it emulsifies. 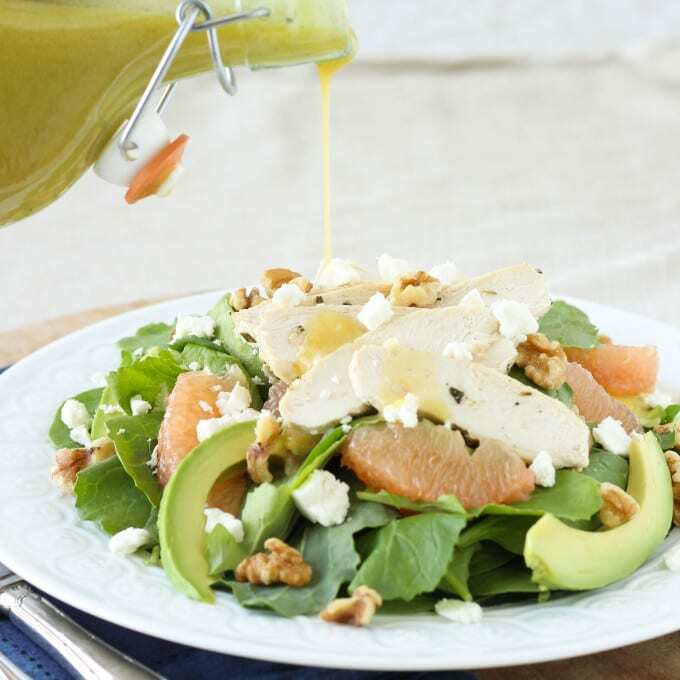 This dressing has enough mustard in it that you don’t have to be finicky about how you add your oil. If you do choose to invert the proportion of oil to vinegar then you should follow a more traditional preparation: whisk together all ingredients except for oil in a bowl, then slowly drizzle in the oil while whisking vigorously until the oil is emulsified. 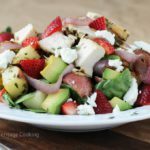 Some nights I've made this salad without the chicken and it made a filling and wonderful vegetarian dinner! Lindsey! You are just giving me too many great new recipes to try! When will I find the time? I love so many things about this salad. The warm, roasted veggies (my absolute favorite! ), the lemon and rosemary, the goat cheese… and that balsamic lemon rosemary vinaigrette sounds fantastic! I’m pinning this and adding it to my menu plan! lol! Serves you right because just this week I have FIVE granola recipes to try from your site!! Thanks for the pin! Clearly I am in love with this salad! Me too! I hope you do try it! Thanks, Natasha! I bet they would! So filling and easy all at the same time! Every night for 3 weeks!!! It must taste as good as it looks. I love that you used so many ingredients. For me, the more different things there are in a salad, the better. Pinning! Lol! I know! I had is last night too 🙂 My salad philosophy is “The More the Merrier!” Thanks for the pin! What a terrific entree salad! 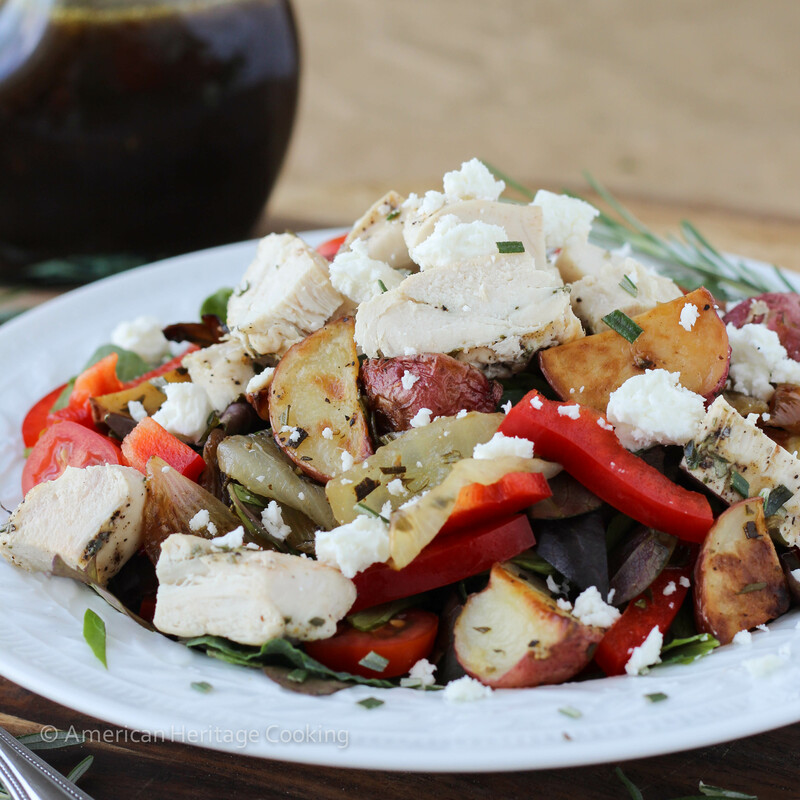 I’d totally eat this in the summer…warm potatoes and all! Me too, obviously! 😉 Although it would be nice in the winter too. Oh you changed the look of your blog! I don’t see your welcoming face anymore, nor those books for the header! That’s one hearty looking salad. I love roasted veggies. I’ve actually been eating more veggies than usual these days. Yay for me lol. From looking at the ingredients alone, that dressing sounds delicious! I love balsamic. Hope your hubs returns soon! 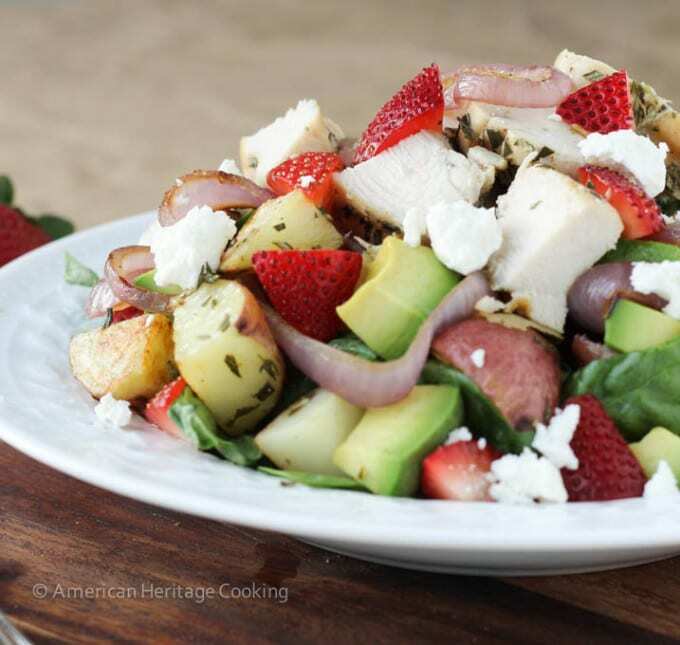 This salad looks FABBBBBulous…And, I ssssoooo know what you mean about the hubby being out of town! It puts such a crimp on our food blogging lifestyle! But, I’m not one that can eat the same thing over/over, so I get REALLY lazy and don’t cook. But, when I look at this salad, I’m thinking I can do this!!! 🙂 This looks delish even if you eat it multiple times a week! Totally feeling this vegetable salad here. Just screams out summer to me… also screams out delicious! Thanks, Pamela! I bet you would love it! And you probably grow half of the ingredients in your garden…bonus! If I was cooking for just me, this salad is exactly the kind of meal I would want. Actually, its exactly the kind of meal I want even when I am cooking for my family! With tiny tweaks here and there, this would please the vegetarian, the carnivore, and the vegetarian-gluten free in my house. Any time I can prepare just one recipe for everyone is a win! It is easily customizable for everyone! That’s one of the great things about salad! I love warm salads too! There’s something comforting about them, also roasted veggies with rosemary is one of my favorite combinations. Can’t wait to try! Totally comforting! And it’s one of mine too!!! I will definitely try this one!! Thank you – it looks delicious and healthy. I think you’ll love it, Josephine! !